How to answer “What can you do for this company?” interview question. What would be your best answer? First of all, be sure to have researched the company prior to the interview, so you are familiar with the company’s mission. Respond by giving examples why your education, skills, accomplishments, and experience will make you an asset for the employer. 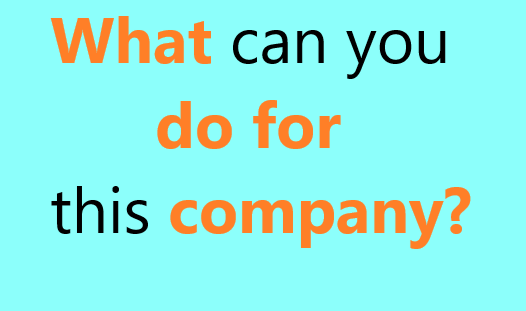 This question is really asking you to demonstrate what skills you have to offer the company. It is important to keep the job requirements in mind when answering it, but think more of the company as well as that specific role. It may be wise to say that you are ambitious and hoping to work your way up through the company, which will demonstrate your dedication. Find out about the ethos of the company, so that you can make sure that you can show that you have the same aspirations as well. It is also worth using examples of how you have used your skills in previous jobs to help with the sorts of things that the company is trying to achieve. This sort of question is one that it is important to prepare for beforehand. You may not be asked it, but if you are, you do not want to be on the spot. It is important tod o research about the company anyway and so it will not be a waste of your time. Make sure you know what the company is trying to achieve, what their goals are. Then make sure that you can match some of your skills and experience to those goals. It is important to be specific if you can as that will allow you to show that you have done your research well. If you are quoting a newspaper report that perhaps says the company is in trouble or are trying to achieve something then it is worth quoting where you got the information from. This is because it could be incorrect but at least you are showing you have done some research. Keep your answer fairly short and specific. Try to answer in a few paragraphs with reference to the company, the role and your experience. If you have prepared something, then this should be easy for you to be able to do. Make sure that you show respect for the company, so even if they are in trouble and need help, make sure that you come across as you being sorry for that and wanting to help them rather than it coming across as a big problem. Make sure that you rehearse your answer out loud so that you sound confident when you are saying it. This will also help you to make sure that it makes sense. As I have worked in a similar setting before, I am sure that I am perfectly experienced to carry the role out. Having worked for McFarlane’s I am very adept at all stations within a fast food environment. I know you need a burger cook, but I can offer you more than that. I can carry out that role, and all other cookery AND client serving stations within the restaurant, as well as already holding top ranks for all aspects of fast food service, so I will be offering you much more flexibility than most other applicants. Being a skilled salesman, and knowing that you are looking to sell an extra 10% of your stock over the coming quarter, I know that with my experience and personality I will be able to achieve that for you. In my last position, I was set a challenge of raising my sales by 20% for the first quarter of 2012, as the last quarter of 2011 had been average. I actually managed to apply a new angle to my pitch and exceeded the previous quarter’s sales by 34%. I was very proud of this achievement and would love to prove that I have what it takes to translate this success to your venture.